After reading this review I think you’ll agree the Coolest Cooler Company does in fact make the coolest cooler ever. 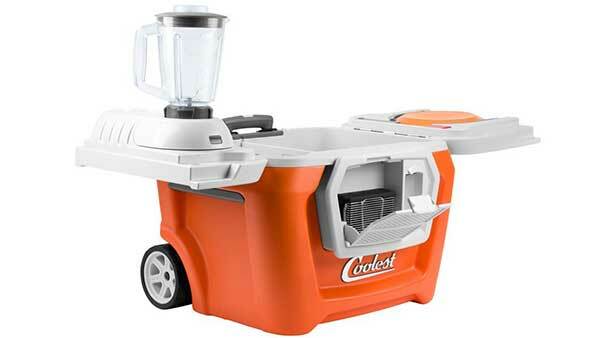 It is more than just a cooler with a blender, speaker, and wheels. This cooler has tons of features including a built in USB charger, LED lid light, bottle opener, magnetic cap catcher, a strong handle, cutting board, plates, a knife, and more. The cooler itself is splashproof, so it’s perfect for the beach, boating, camping, or other outdoor activities. And most importantly, it keeps ice for up to 5 days. The Coolest Cooler is the Swiss Army Knife of coolers. As I said before, it is equipped with Bluetooth speakers, a blender, wheels, a strong handle, LED light, bottle opener, knife, plates, and more. I will talk in detail about each feature below. Having a cooler with Bluetooth speakers built is awesome for listening to music outdoors. The coolest speaker has a resonator panel that together with the speaker itself, put out a ton of sound. The speakers are also splash proof and water resistant. The outer shell of the speaker protects it from damage if it is accidentally dropped. The Bluetooth speakers easily pair with smartphones or Bluetooth compatible devices. The Coolest also has a feature called party pairing, which if you have 2 coolest speakers, allows them to play music together, or you can take turns playing your favorite songs. The speakers sync by simply pressing a button on the top of the speakers. Having a cooler with blender is perfect for making alcoholic or nonalcoholic beverages outdoors. To use the blender, you’ll need to have the battery inserted. When the battery is inserted, the cooler is always on. They designed to product this way for simplicity. The blender can only turn on when the pitcher is inserted. 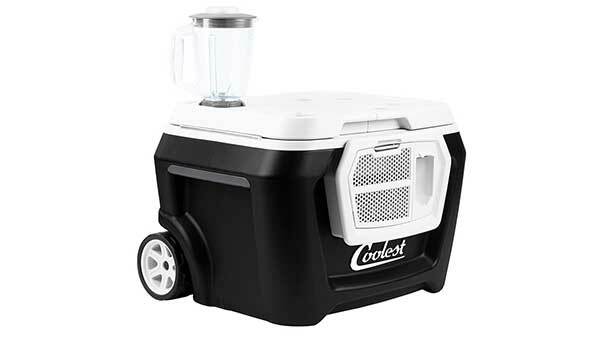 With the Coolest Cooler, you can make frozen margaritas, strawberry daiquiris, or your favorite drinks wherever you go. When it starts the get dark, you can turn on the coolers LED lights by just pressing the lights button under the lid of the cooler. The light is perfect for finding what you’re looking for the in cooler. If you forget to turn the light off, it will automatically shut off in a few minutes to save battery. The USB charger on the coolest can easily be accessed by removing the waterproof plug that covers the port. A USB is super convenient for charging phones and other small electronics when it might not be possible to get to a conventional power source. It is ideal for charging devices when camping, at the beach, or boating. The cutting board on the cooler is perfect for cutting limes or other items when there isn’t a table nearby. The cooler has housing for the knives and plates. Everything on the Coolest fits together perfectly. A lot of people also use the plates as a frisbee. The coolest is equipped with a super strong handle and wide rubber wheels. The wide wheels make the cooler easier to pull on certain surfaces, and prevent floors from being damaged. 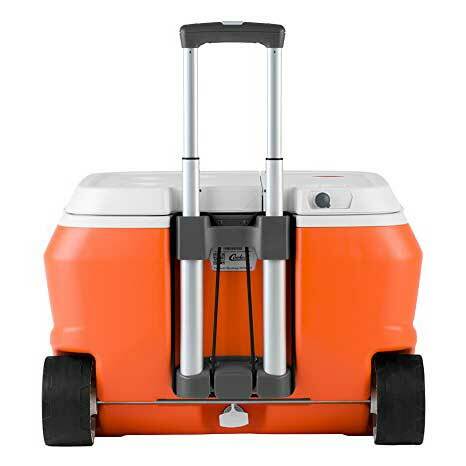 Coolers can be super awkward to carry, so having wheels and a handle is an excellent feature. The cooler also has a bungie cord near the base of the handle, so you can sure other items on the top of the cooler. The cooler also has a built-in bottle opener. It is located right on the front of the cooler next to the speaker. Just below the bottle opener there is a magic cap catcher, which can hold multiple caps. On the front of the cooler, you will also find a corkscrew opener, which attaches magnetically. The battery on the coolest cooler was specifically designed to power the ice blender. You can easily check how much battery you have remaining simply by pressing the battery life indicator button. The coolest comes with battery charger. To recharge it, all you must do is slide the battery onto the charger. The battery actually connects to the bottom of the lid, and is protected by a water seal to protect it from water damage. With a 55-quart capacity and all the features mentioned above, you can see why this item is a hot buy right now. The day I’m writing this review, the cooler is sold out in certain colors. I recommend searching Amazon or the coolest website here to see what colors they currently have available. If you have questions or comments, feel free to leave them below.